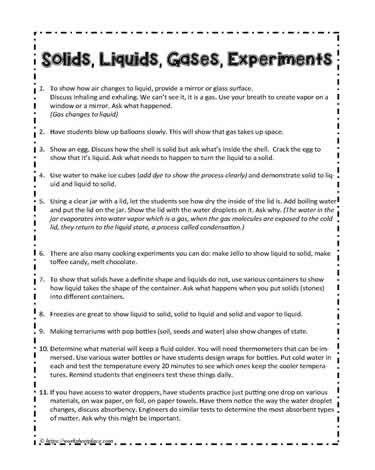 To show how air changes to liquid, provide a mirror or glass surface. Have students blow up balloons slowly. This will show that gas takes up space. Show an egg. Discuss how the shell is solid but ask what’s inside the shell. Crack the egg to show that it’s liquid. Ask what needs to happen to turn the liquid to a solid. Use water to make ice cubes (add dye to show the process clearly) and demonstrate solid to liquid and liquid to solid. Apply some hand sanitizer to student’s hands. The hand sanitizer is a liquid, it then evaporates turning into a gas. There are also many cooking experiments you can do: make jello to show liquid to solid, make toffee candy, melt chocolate. To show that solids have a definite shape and liquids do not, use various containers to show how liquid takes the shape of the container. Ask what happens when you put solids (stones) into different containers. Freezies are great to show liquid to solid, solid to liquid and solid and vapor to liquid. Making terrariums with pop bottles (soil, seeds and water) also show changes of state.